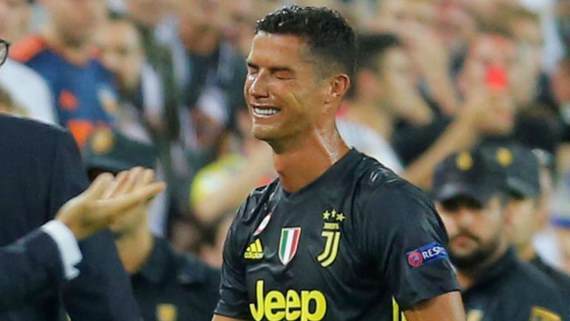 Cristiano Ronaldo saw red in controversial fashion in Spain on Wednesday as his Champions League debut for Juventus ended in tears. The sending off did little to upset the Italian champions’ rhythm though as the 10 men went on to seal a 2-0 win over Valencia at the Mestalla thanks to two penalties from Miralem Pjanic. The touchline official signalled for an offence and after consulting with his assistant German referee Felix Brych pulled out the red card. A stunned Ronaldo, who was back in Spain for the first time since his summer move to Juve, left the pitch in tears. It was the 11th red card of his career, but his first in 154 Champions League appearances and came just days after the 33-year-old had scored his first two goals for Juventus at the weekend in a 2-1 win over Sassuolo in Serie A. After the game, Juventus boss Massimiliano Allegri said he was disappointed with the decision and said it was further proof of the need for VAR. "I can only say that VAR would've helped the referee in this decision," Allegri said. "Going down to 10 men in the Champions League for an incident like that is disappointing. We risked losing with this and we'll miss him for the next games too." Ronaldo will miss Juventus' next match in the competition against Young Boys on October 2, and could miss a return to Manchester United three weeks later if his ban is set at two matches.